November 13, 2013, 3:08 p.m.
Transport for London (Tfl), which runs the London Underground, took to some unusual measures to control congestion on parts of the Northern Line. Commuters were handed leaflets on Monday urging them to consider alternative transport – such as walking – between Tooting Bec and Clapham North, where commuters regularly have to wait for 2-3 trains to pass before being able to board. A YouGov poll of Londoners reveals the Northern line as their least favourite tube line, with the Jubilee line the capital&apos;s favourite. 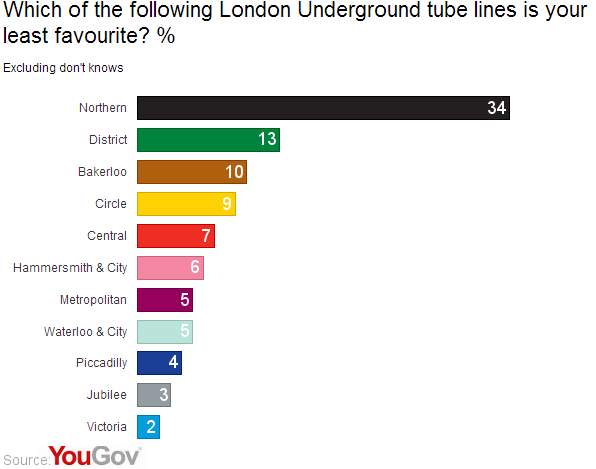 One-third (34%) of Londoners with an opinion on the matter said the Northern Line was their least favourite tube line, way ahead of the District Line (13%) and Bakerloo Line (10%). The research was carried out at the end of last week – before the measures were announced on Monday. 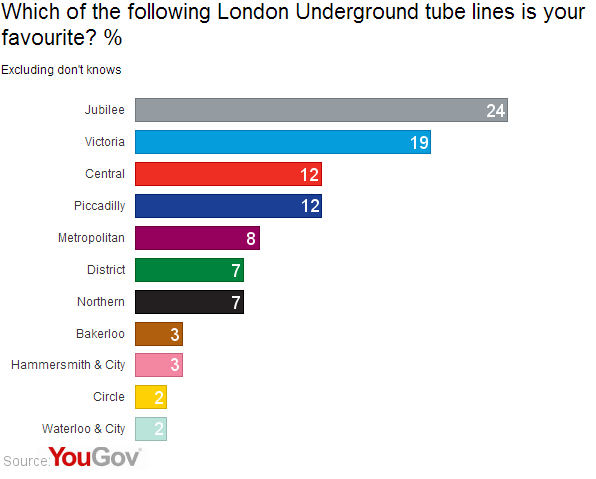 On the other hand, the Jubilee line is London’s favourite tube line, chosen by almost a quarter (24%) of Londoners, just ahead of the Victoria Line (19%) in second place. The Central line and Piccadilly line came in joint third (12%). The last time demand management measures were used was during last year’s Olympic Games, when the record for daily tube users was broken twice in one week. The Northern Line is currently being upgraded to handle an extra 11,000 passengers an hour in the hopes of resolving the congestion problems. A Zone 1-3 travelcard, which might be used by commuters regularly travelling from Tooting Bec to Central London, costs £136 a month.